What's more Christmassy than a red lip? I usually don't like to wear a bold lip during the Holidays, simply because it can stand in the way of lots of eating. However, when you pick the right lipstick, it doesn't have to be a bother. 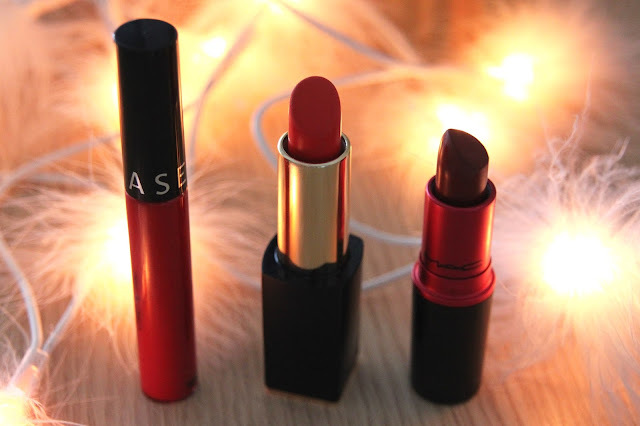 Here's my top three, no budge, red lips. This one is a pure red, bold and bright. It can be patted into the lips as a stain as well, though. And it will not budge, trust me. The applicator is easy to use as well, and you can re-apply throughout the evening without too much of a hassle. If you're not into real reds, a more orange-y one is very flattering. I haven't found a more gorgeous orange red than Kendall Jenner Restless. It applies well, doesn't feel heavy on the lips and seriously stays put. I think this might be my choice this year. Last year, I wore this combination. It's more of a deep red, due to Burgundy. I absolutely love this during the colder months. I also feel like Viva Glam I doesn't dry out my lips at all. If you're a lover of deep reds, this might be your winner. What's your favorite Holiday red?